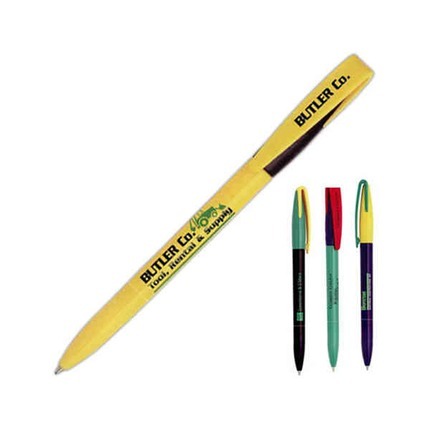 Recycled pen made of 100% recycled materials. Made of 100% recycled materials (70% post-consumer). Black, medium point standard, blue ink cartridge available upon request. Great environmental promotion. Great trade show handout. German components assembled in the USA. Customize with your choice of component colors: Black, green, blue, red, yellow. Sleeve included for every pen. One color, one position imprint. Addition color imprint add: $0.12 ea.